Birkelunden Marked is a second-hand and bric & bracs market, that was started in 2003, and is located in a public parc by the same name, Birkelunden parc, at Grünerløkka district in Oslo. 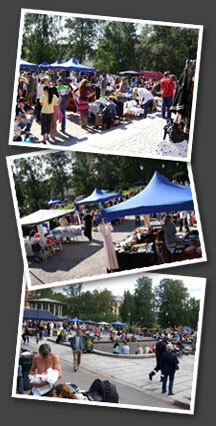 This market is primarily a second-hand and antiques market, but offers also jewelry, arts, craft or self-made items. Pirated copies of DVDs, CDs or related Products. Children toys manufactures with plastic softener, dyes or prime materials that are forbidden in Norway – all such goods shall be CE marked. Weapons, both sharp and Sealed. Mobile Phones, chargers, PCs, IT equipment, Mp3 players, IPod and all other electronical products. IS NO LONGER ALLOWED TO SELL . This by regulation from the police. Knives, bayonets and the likes MAY BE SOLD, BUT SHOULD BE PLACED IN A BOX WITH A PLEXIGLASS LID. SUCH ITEMS ARE TO BE WRAPPED UP AT THE TIME OF PURCHASE. ID REQUIREMENT – MIN. AGE LIMIT 18 YEARS. NEW REGULATIONS FROM THE POLICE IN 2016. SAYS: ALL SELLERS BOTH REGULAR AND SPONTANEOUS OF USED STUFF, MUST FROM NOW; HAVE PERMISSION, CALLED “BRUKTHANDELBEVILLING”. We do not welcome sellers that only offer to sell new mass produced goods. Jewelry, arts, crafts and other self-made products are exempt from the evaluation. The market is open every Sunday in 2016, as of January 3th until December 18th, except on public / religeous holidays as well as on car-free town days at Grünerløkka. For 2016 these exceptions will be March 27th (1st day of Easter) May 1th ( Public holiday) and May 15th (Pentecost). District Days for 2016, under the auspices of Grünerløkka Commerce and Industry, http://www.sentrum.biz/ , are on the following week-ends: 29th of April – 1th of May, 17th – 19th of June, 19th – 21th of August, and 16th – 18th of September. January; 3th, 10nth, 17th, 24th, 31th. February: 7st, 14th, 21th, 28th. April: 3th, 10th, 17th, 24th. July: 3th, 10th, 17th, 24th 31th. October: 2nd, 9th, 16th, 23th, 30th. November: 6st, 13th, 20th, 27th. The police request that all sellers attending Birkelunden market must be pre-enrolled on a list which is sent by us to the police by e-mail on every Thursday morning before a market day. The dead-line for registration on the list we are sending to the police, is Wednesday evening at 18:00, ahead of the disired market day. NAME, ADDRESS AND IDENTIFICATION NUMBER, ON THE PERSON RESPONSIBLE, AND ANY ASSISTANTS WHO WILL WORK ON SELLING SPACE. AND COMPANY NAME AND IDENTIFICATION NUMBER, WHICH WILL BE RESPOSIBLE FOR SALES. We only have the lower gravel place at our disposal, and all 58 sales stands are reserved to our regular sellers. Only when some of the regular sellers cancel their spots will there be available stands for those who have signed up on the SPONTANEOUS list. Send your application by e-mail through the “Contact us” link on this site, and include name, e-mail address, mobil number, and the name of the market you wish to attend. In this cace Birkelunden Market. The “message box” shall include the following information: Identification number, address to the responsible seller. Assistants sellers, must also be registered with their name, identity number, and address. And information about the Company, and use trade License from the police. We also need 5 to 7 alternative dates you would like to participate, and what items you will be selling. You will thereby be registered on the list that will be sendt to the police on the Thursday ahead of the desired market days. Copy of valid second-hand shop License, delivered us as an organizer at the first market Sunday. Even though you are registered on the list to the police, this does not garantee a sales stand. This depends on any cancellations from regular sellers. When you are allocated a stand, you will be contacted by SMS during the course of the week and latest Saturday evening. There’s approximately 30 to 50 sellers waiting for a spontaneous placement, in turn, defined by when their e-mails are received in our mailbox. Have you not heard from us by Saturday evening means that you have no sales stand the next day. This is due to the fact that no, or few, regular sellers have cancelled their spots. All sales stands are reserved until 11:30 Sunday morning. Have you not received any sales stands you may call us on Sunday morning, around 11:30, phone: 93851781, to check if there is an opening, as many regular sellers wait until Sunday to make their cancellations. We have no possibilities ourselves to make phone calls on Sundays due to the work load. Any available spot will then be given to anyone who calls in, disregarding the Spontaneous list. The spontaneous list is meant for sellers who which to sell 1 to 2 times, based on 5 to 7 alternative dates, and not over a long period of time. Sellers can not be registered on the list to the police on a permanent basis, as this one would be too large. This is a privilege for regular sellers only. Applications that do not include the information requested above, will not be added to the list sent to the police, and have therefore no opportunity to be on the spontaneous list. Sales stands up to 3,0 x 1,5 m are allocated , which normally allows for three pieces of equipment. All profiling can be done on the longest side, as well as 1 of the short sides. Equipment such as tables, cloths racks and the like can be rented out. SEE DETAILED PRICELIST FURTHER DOWN ON THIS PAGE. It is not allowed to place items of clothing directly on the ground, or on tarpaulin. Items of clothing are to be hung on racks – smaller items can be placed on a table. Knives, bayonets and the likes should be placed in a display box with a plexiglass lid. Such items are to be wrapped up at the time of purchase. ID requirement – minimum age limit 18 years. Weapons, both sharp and sealed, cannot be sold. The police recommends and forbids this. We ask all sellers to take with them all garbage related to their market activities, such as empty cardboard boxes, broken or damaged goods, upon departure. The market has no garbage handling, and it costs us both time and money to get ridd of the garbage. The rubbish bins in the parc are there to collect fast food packaging, coffee-cups and the like. Parking in the parc is forbidden. Entrance to the parc is only allowed on paved walkways and only before and after sales time, for unloading and uploading – i.e. before 12:00 and after 18:00. In the period between 12:00 and 18:00: No vehicles are allowed in the parc. An Exception to this rule can be granted during sudden rain showers, or the like. All driving or parking on the grass is strongly prohibited. Violations of these rules may result in the rejection of the seller(s). On Sundays: We are only available on mobile: 938 51 781. Ordered stands are reserved until 11:30 on the market day, for later arrival please notify us on the following number : 93851781. The organiser / promoter will collect all fees during the course of the market. Sellers rigg-up from kl.09:30 – 12:00. Sales time is from 12:00 – 19:00. Garbage related to the market activities, such as empty cardboard boxes, broken or damaged goods, should be removed from the parc by the sellers themselves upon departure. The market organiser does not handle garbage. The rubbish bins in the parc are there to collect fast food packaging, coffee-cups and the like, NOT market related garbage. Rental of equipment such as tables and clothes racks should be agreed upon in advance. We do not allow clothing or other smaller items to be placed directly on the ground, or on tarpaulin. The reasons for this are the lack of space due to the number of stands, as well as the need for paths large enough to allow electric wheelchairs and prams to pass between the stands. For all regular sellers: all cancellations are to be made as soon as possible at the latest by tuesday morning before the actual market day. This will allow us to contact potential sellers who are on the waiting lists. The power connection point is by the horse-statue, in the lower side of the parc. Sellers must bring their own extension cord (long enough to reach). Rental of equipment such as tables, clothes racks, and tent must be agreed upon in advance.